Birmingham Academy (previously known as Desktop Solutions Business School) was successfully registered as a Private Education Institution (PEI), under the mandatory Enhanced Registration Framework (ERF) with the Committee for Private Education (CPE). They provide opportunities for Singaporeans and international students to achieve academic excellence through their preparatory courses and certificate courses. Flexible teaching methods are adopted in a small classroom size, maintaining a maximum teacher-student ratio of 1:32 to achieve positive group learning for our students. In addition, students can quickly catch up with listening and speaking skill in an English speaking environment, laying a firm foundation for later development. In Birmingham Academy, they provide adequate facilities and care for the students by building a group of professional team of academic and non-academic staff to provide the students with enriched learning experiences to achieve their excellence in life. Each of their trainers / lecturers are not only suitably qualified but are also sensitive to the culture and learning needs of students. 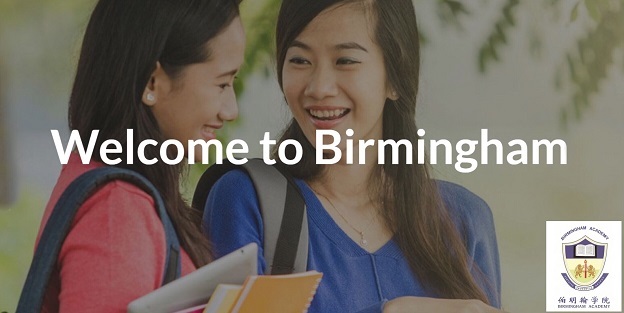 Apply for Birmingham Academy’s courses directly via SchoolBuzz, Asia’s leading direct course application platform at www.schoolbuzz.com.sg. It’s easy and free!